Get your Full Irish now! I had another post about Ceili Cottage lined up, but I’m preempting it with this one. Why? 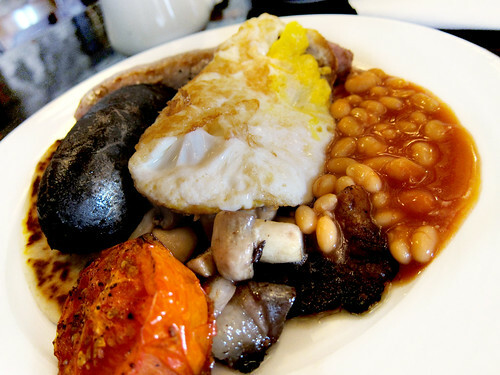 Because though we were told “next week” when we asked about the Full Irish (banger, rasher, black pudding, beans, mushrooms, grilled tomato, potato farl, fried egg) during our last visit, we didn’t really believe it. But apparently, I was wrong to doubt. Ever since we spied this on the menu during our first visit, we were eager to have a taste of this hearty meal. Finally making its debut five months after opening, we sat in anticipation, hoping it was worth the wait. Let me start off with the not-so-good. While most people won’t eat blood sausage anyway, we were sad to see (and taste) that it was over-cooked and mealy. We’d had a really delicious example of it recently at Earth, so this was in stark contrast. Hope that they can fix that since the rest – well, the rest is really good. Of everything on the plate, the banger was best executed – juicy, lightly spiced, and a strong pork flavour. Really quite excellent. The rashers and mushrooms were decent and tasty, with bonus taste-points going to the roasted tomato – it had a really nice savoury/umami hit. I found the pancake-like potato farl a good item to help wipe my plate clean. But my personal favourite were the beans. They reminded me of when I was a kid and the breakfasts my dad used to make for me. Not that we’re Irish. The beans were tasty enough that I stole strays from a neighbouring plate. I loved each bite – especially when I could mix in some of the runny yolk from the fried egg. The Full Irish is Tasty and comforting, the way a breakfast like this should be. Wow that looks absolutely awesome! Nice big lump of black pudding! I’ll give it a spin next weekend! Let me know what you think of it! And was your black pudding better? Has the food at the Ceili actually improved? I was there this past summer, and will probably never go back. Four of us went, and the food was awful, ranging from dried-out macaroni and cheese to fatty mutton I would never serve to any guest. I think the food is decent-to-good pub fare, but I wouldn’t call it destination-worthy. I really do think the charm of Ceili Cottage is in the people and atmosphere. I’ve written up on some of the other meals I’ve had there recently, and again – solid food. While I didn’t love the macaroni, it wasn’t dry for me. The mutton stew that I had recently was actually pretty good. I didn’t get giant chunks of gristle or anything like that, so I’ve had much better experiences than yours. I’d give it another shot you were in the area, but I’m not sure you’d find it worthwhile if you went out of your way for it. Try the creamy tomato double-smoked bacon soup if it’s on the specials menu. I quite enjoyed it, though it was salty. i’m a west-ender so when i had the chance to try this place around noon, i jumped at it. unfortunately i was disappointed. i found the menu small, which is fine, it pushed me to order the full irish, which is really one of my favourite meals ever. i found the blood sausage to be also very very overcooked, and it literally crumbled when i cut into it. everything was ok. it was a little disappointing because i left a little hungry (either the portion is small or i can eat A LOT) and it wasn’t the cheapest breakfast. or greatest.